37 nanoartists from 13 countries and 4 continents sent 121 NanoArt works to this second edition of the international competition. Public online voting is now open through March 31, 2008 at www.nanoart21.org. Judging is via the Internet and decided by the site visitors. 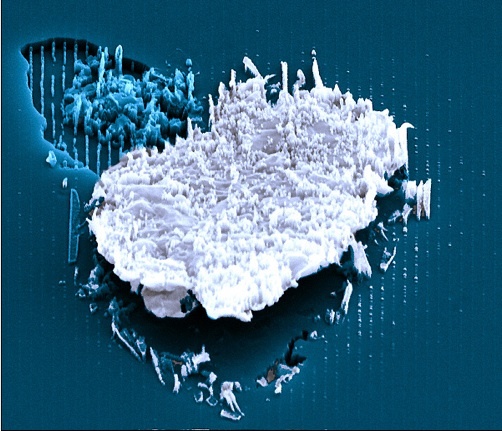 This site was founded by the artist and scientist Cris Orfescu (www.absolutearts.com/nanoart) to promote worldwide the NanoArt as a reflection of the technological movement. NanoArt is a more appealing and effective way to communicate with the general public and to inform people about the new technologies of the 21st Century and should raise the public’s awareness of Nanotechnology and its impact on our lives. The original image was taken from nanograting research. The process used was: thermal oxidation of silicon, deposition of a thin Cr layer, spin-coating of 200nm thermal plastic resist, nanoimprinting of a grating structure into the resist, and plasma etching of the resist, Cr layer, and then silicon oxide layer. This image is a failed portion of the oxide etch step, probably caused by insufficient Cr etching. The image has been subsequently cropped and colorized to accentuate features and suggest alternate narratives. Some are pretty terrible, and resemble the artwork of the mad scientists these guys probably are.